to adjust to new ideas, to remain vigilant and to face the challenge of change. 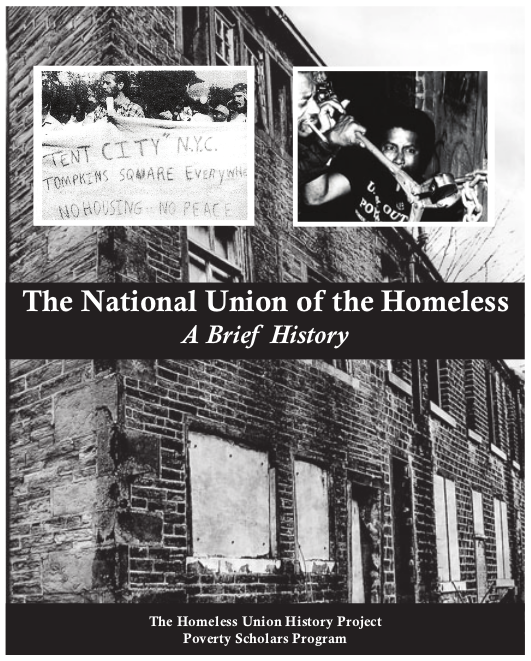 The Homeless Union History Project (HUHP) is a study-work project of the Poverty Scholars Program. The purpose of the HUHP is to train, develop and unite leaders with a collective understanding and analysis of the history of the National Union of the Homeless (NUH), and to further the work of the Poverty Scholars Program. The history of the NUH is not one that has not been and will be recorded in US history textbooks. The history of the NUH is one of struggle and of social change. It is a history of the homeless and dispossessed thinking, speaking and organizing for themselves on a national scale. It is a history that emerged from a moment during which, for the first time in US history, families were increasingly becoming homeless on mass scale. The HUHP documents and narrates this history not only to preserve it for future generations, but to draw lessons from it for the for the purpose of building a broad-based social movement to end poverty today.